Hervey Bay is an amazing place for tourists and everyone thinks of us as a tourist town but there’s a lot more to Hervey Bay than just tourism and some of the most innovative businesses here in town are not among the most obvious. These businesses might not have a shopfront or an office. Clients and customers rarely if ever come to their door but those businesses are out there, taking their products to the world thanks to the Internet. There are packaging designers … importers of everything from coffee machines to paper flowers … retailers and wholesalers who sell everything from computer mice to fishing tackle and cafe equipment … and even people who have designed, manufactured and now retail their own products. The latest that we here at the Gossip have come across is an unassuming guy who, despite some debilitating injuries that now confine him to a wheelchair, has designed a simple tool that gives other wheelchair users the freedom to go fishing. Robert Agius from Reel Keen has designed the Reel Keen Rod Holder … a tool that basically turns a wheelchair into a game chair in just a few minutes. 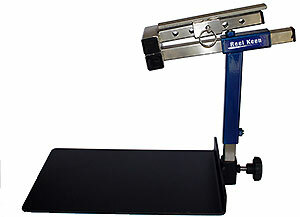 A heavy baseplate uses a person’s weight to anchor the rod holder to their wheelchair and the rod holder then holds and supports a fishing rod. Robert is now marketing the tool on his website and he’ll ship it anywhere in the world. So if you know someone who loves to fish but is restricted because they’re in a wheelchair then get them to have a look at the Reel Keen Rod Holder.